Together with the Italian architect Stefano Boeri, we are realising two Dutch Bosco Verticale buildings in Eindhoven and Utrecht. The many trees, shrubs and plants that will be planted on the tower will form a green ecosystem which will combat pollution. This is not immaterial considering that in ten years’ time, 60% of the world population will be living in cities. This extreme condensation of people will bring about a huge concentration of CO2 production, with major consequences for the biodiversity and air quality in cities. With an annual absorption of tens of thousands of kilos of CO2, these green oases will not only claim a prominent position in the city but also contribute to their surroundings in many different ways. Both towers show that good housing, realising a larger biodiversity and a happy and healthy community are far from mutually exclusive. The trees and plants offer shelter to butterflies, bees and other insects, which will in turn attract many birds. And it looks spectacular to boot. Co-designing these ‘city lungs’ as creative engineer and co-architect is a beautiful, complex and relevant assignment. This type of plan involves many aspects, and the bar has been set very high. We have a high sustainability ambition, obviously, which requires careful choices regarding flexibility, quality of living, comfort, installations and materialisation, among other things. And then there are the trees and shrubs. How do we place the planters, how do we secure them to the outer wall and make sure it is watertight, how do we ensure irrigation (with collected rainwater as far as possible, of course) and how do we maintain all that green? How do we materialise and detail the façade in such a way that it does not become as green as the plants within a year? Plenty of challenges to which our experience greatly contributes. The 75-metre-high Trudo tower at Strijp S in Eindhoven is being developed by housing corporation Sint-Trudo and contains around 125 rental lofts. Besides shops and restaurants, the ground floor will also house a communal garden of approximately 350 square metres. The first floor will have storage and office space. The construction starts next month. Once completed, the building will act as a green oasis in the city. Calculations show that this residential tower will annually absorb around 50,000 kg of CO2 and supply 13,750 kg of oxygen. 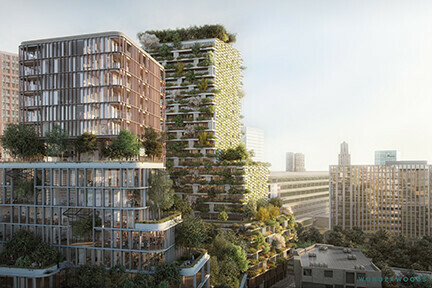 The construction of the vertical forest ‘Wonderwoods’ in the Healthy Urban Quarter at the heart of Utrecht will start in 2019 and should be completed three years later. This project, which was initiated by G&S Vastgoed and KondorWessels Projects, involves two towers in which living, working and recreation will be combined. From the apartments, residents will have a great view on their own green balcony, and they will have access to the public green roof gardens. The Wonderwoods design by Stefano Boeri of Stefano Boeri Architetti and Roberto Meyer of MVSA Architects will have 360 trees and nearly 10,000 shrubs. These will consist of an appropriate regional assortment that will be compiled and grown, inspired by the Utrechtse Heuvelrug. Inbo is co-architect for the highest of the two towers, by Stefano Boeri Architetti.